Note: 3-15-14 - This help page is starting to become a bit outdated but everything explained here still applies. I have been adding new features that are not listed here. Most new features are explained in the Community freePatternWizard area. Sometime in the next month or so I'll be adding better usage assistance. Color Sensitivity: This is probably my favorite option of them all. Here you can set it so the system chooses more colors or less. The default is a value of 20. I find that if I'm getting 30 or 40 colors in the final pattern and want to cut the number down, sliding the button a little to the right may cut the number down to around 12-15 colors. 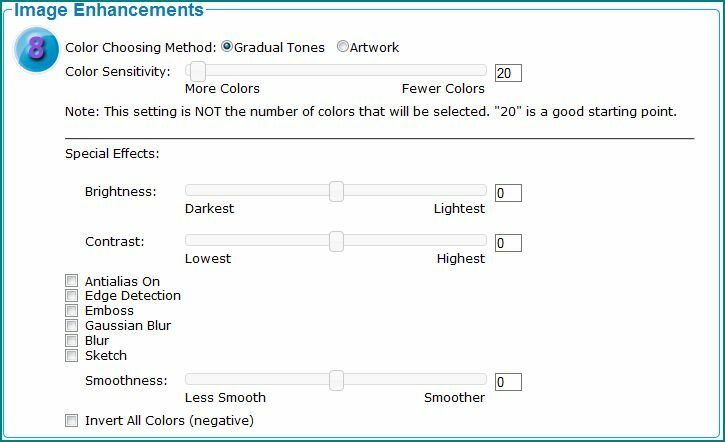 I often find that the colors chosen in the final palette when changing this option slightly to the "fewer colors" side are often more accurate to the original. You can actually try different settings, cutting down the number of colors a little at a time, until the colors in the pattern look bad, then reverting back just a bit. I have taken an original image that was creating a pattern with 93 colors, and by adjusting this option up a little, got it down to 10 colors with no noticeable color mismatches. So do experiment with this option! Change Brightness: You can change the image brightness if desired. Your original image quality will determine whether this function needs to be changed. Simply slide the control to the right or left to make changes. Smooth: As the name implies, it smooths your original. Not! But it does do some interesting things to your image when you set it down near the lower settings. I think the higher settings do a bit of smoothing of lines. All in all, just an interesting option. Print Pattern: This button will show if your pattern is small enough to print onto a single page of paper. If not, the Print Pattern button will not show and we suggest creating a .pdf pattern and printing that. When the Print Pattern button does show, clicking on it allows you to print the pattern you just created. When clicking on this button, a new window will open, as well as a print window. Assuming you've printed before with your computer, the operation is the same. After you press the "Ok" or "Print" button in your print window, your computer will print the pattern. You may need to change your print settings to either adjust the size or split it into multiple pages. After printing, the print and smaller pattern windows will automatically close and you'll be left once again at your pattern page. 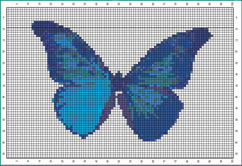 Note that this is not a screen print, but actually only prints the pattern, from just below the buttons to the number of colors and stitch count. Below the color swatches and counts is your copyright notice, if you entered one. Three other pieces of information are below the color swatches. First is a shameless mention that our software generated this free pattern. Below that, are the total number of colors used, and total number of stitches in the pattern.